Path Finder 8 is the latest version of Cocoatech’s macOS Finder replacement. Finder being the integrated file handler in macOS and really improved in Mojave OS, does come with limitations. Path Finder 8 is along with Forklift the best replacement for the basic Finder. The most important change in version 8 is ‘ Modules ‘, and the way they are organised and used. 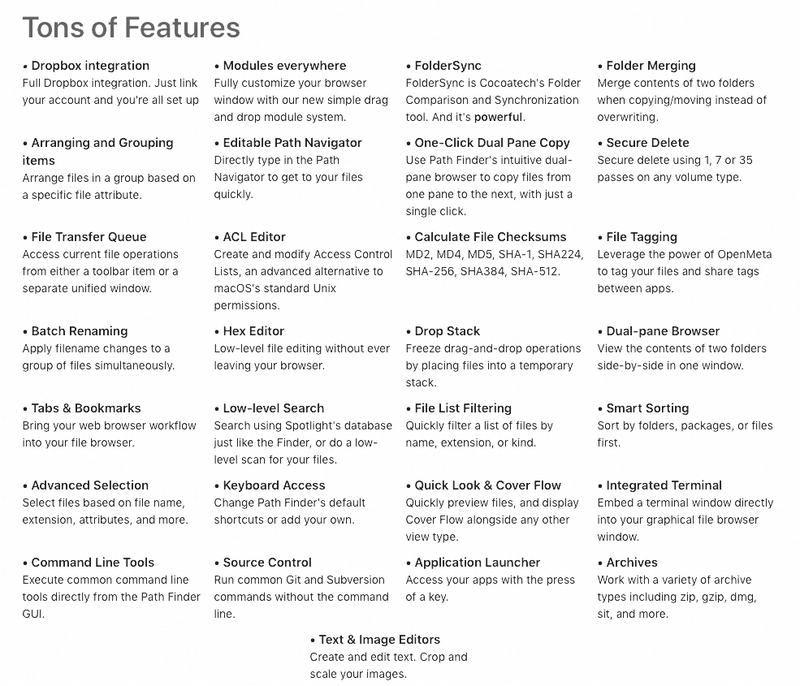 Path Finder 8 is absolutely loaded with features. It isn’t easy to find a meaningful action which is doesn’t provide. The interface is fully customisable and with its dual pane option a joy to use for data handling. The menu bar is customisable as is the total interface including the new modules. Pat Finder 8 is a step forward but sadly also a step backwards in terms of functionality. As I was trying to drag a fielder to Path Finders sidebar, I noticed it would show the inserting image ( line) but not actually granting access to the sidebar. This should be fixed asap, as it is one of the used features of a customisable interface. Collect files with Drop Stack, then copy or move them in a single step. View and manipulate hidden files, is also one of its tricks to help you out. a image distortion. ( check the small image below ). This happens when you click your mouse in a screen area next to the opened Path Finder 8 interface. Suddenly lines darken en add thickness ? This shows Path Finder is still in development I guess. Its no big issue, but simply needs to be tackled in future releases(updates). Path Finder 8 is the best replacement for your Mac’s Finder. It provides a full options interface and ease of use. The addition of Modules is a bonus but not something you can’t do without. However its interface is showing all customisable information or setup possible. The dual-pane and cover-flow are features you can’t do without. The dark-mode is not really my cup of tea, but may suit others. Dragging folders to the sidebar is a feature that needs to be implemented in next updates as it is one of the crucial aspects of file handling. Still I feel Path Finder to be a great improvement over macOS Finder. Path Finder will always remain our default file handler with or without modules implemented. Once you experienced the pleasure working with Path Finder, you never want to part.